What do the adults say? Recently my husband and I took my Dad away for a couple of days of sheer geekery. On the Saturday we went to Jodrell Nank, and on the Sunday to the National Spaceguard Centre. At Jodrell Bank we (obviously) made a beeline for the Lovell telescope. It’s impossible to get an idea of how huge it is just from pictures or by seeing it from the road, but when you stand next to it it’s really awe-inspiring. You have to switch off your phones on arrival because they could pick up the signal from your phone if it were on Mars (one of the many geek facts we learned during the day) so having that signal on site really messes up their data. There’s a hands-on activity centre (supposedly for the little ones, but the “big children” seem to enjoy it just as much!) where you can find out how we detect planets from beyond our solar system and hear the sound of the Big Bang (which is not actually a bang at all)! Probably my favourite thing there was the infra-red camera. Most people standing in front of it showed up as orange and red. My husband, who is always warm and who wear shorts throughout the winter, showed up as a bright yellow. His image glowed like something supernatural – or for those of you old enough to remember, like the boy in the Ready Brek advert! I’m the opposite. I’m always complaining that I’m cold – even in summer – so when my image showed up as black (nose, cheekbones and fingertips) and purple (everywhere else) I was able to point out that it’s not all in my mind. I don’t just feel colder than everyone else, I really am colder! With hindsight, I wouldn’t have bothered with the tour as we didn’t find out anything from the guide that we hadn’t already read on the display boards, but for anyone who prefers to have all the information condensed into a 45 minute talk it’s probably well worth it. There are lots of displays ranging from beautiful photos of space, to explanations of how radio telescopes work, how and why telescopes all over the world are linked, and a real-time display of the data being received by the Lovell telescope. Aside from the astronomy stuff there are gardens to explore – a little chilly in the winter but probably beautiful in the summer – and a hide tucked away from where you can sit and watch the birds come and go. The Spaceguard Centre was very different. It’s small, it’s in the middle of nowhere and it’s the ultimate in geekery. It’s just a husband and wife team and as it’s a working lab, not a visitor centre, you have to book onto a tour to visit. It’s the only place in the UK that monitors near-Earth objects, so if we are about to be hit by an asteroid, these are the people who will tell us. There were only the three of us who braved the cold that day so we had a very private tour. We got to see samples of asteroids, maps of all the places around the world that have been hit by asteroids, and saw data about near-Earth objects that need to be checked out. We learnt how accurately they can pinpoint where an asteroid will land and the role Jupiter plays (good and bad) when it comes to asteroid activity. I won’t give away too much because, as they get no funding from the government, they rely on the money made from people visiting. We found it fascinating and for anyone with an interest in science who wants something a bit different to do, it’s a definite recommendation! 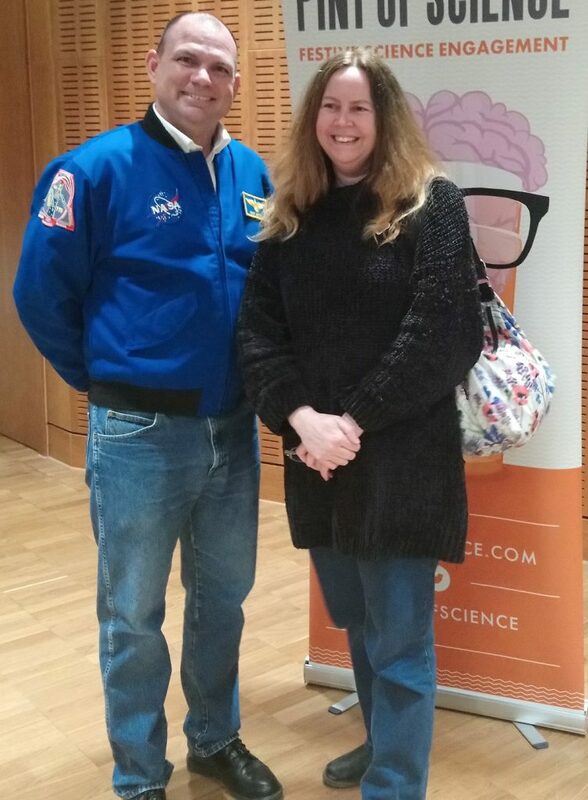 Tonight I met the man with the coolest job title in the universe…Space Shuttle Pilot! I spent the evening at Birmingham University at an event organised by Pint of Science. It was three hours but the time went so fast it felt more like three minutes. There was a brief talk by two professors, one talking about the search for exoplanets and the other talking about her research into antimatter. And then there was a longer talk / Q&A session by Tony Antonelli – he of the cool job title – and we were entertained and amazed in equal measure. It was lovely to see such a mix of ages in the auditorium, and everyone seemed to enjoy it. The wisest words of the evening though came from one of the hosts, who said, “Remember – this man wasn’t born an astronaut.” I think that’s such an important message for our children. No-one is born anything. If you have a dream, and you work hard and you make good choices you can achieve great things. If the Pint of Science Astronomy Tour is heading your way, I definitely recommend that you go. Is it ever OK to let children fail? To be PC or not to be PC?